I still have quite a bit of marinara sauce and pesto in my freezer. These pizzas are the first dishes I have made with them. 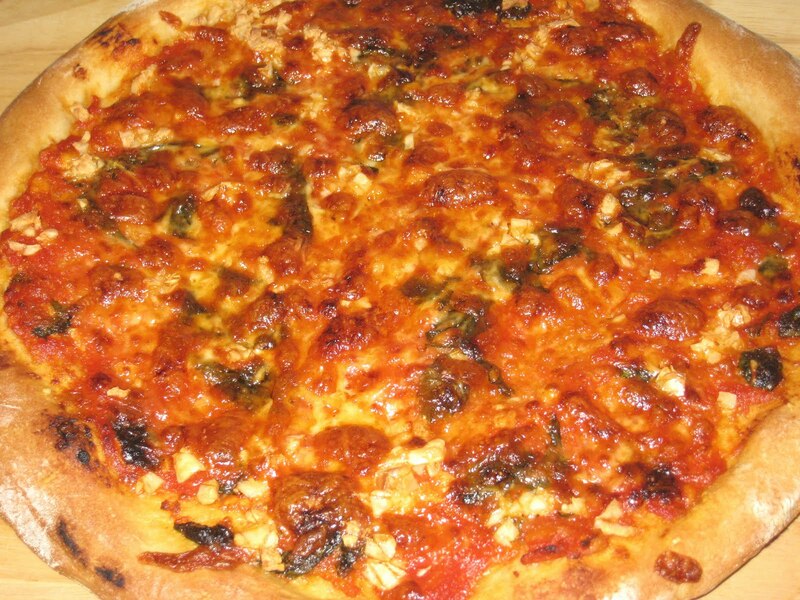 This first one is just your basic cheese garlic pizza - a layer of the sauce covered with grated mozzarella cheese and garlic, and then topped off with grated Parmagiana Reggiano and the last of the fresh basil. This pizza proves, once again, that simple pleasures really are the best. But that's no reason not to keep experimenting. This pizza is a blend of the marinara sauce and some of the pesto, covered with the cheese, garlic, and sliced green olives and, as always, finished off with some Parmagiana Reggiano. 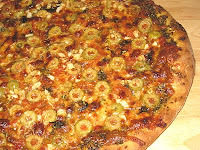 The pesto added an extra depth of flavor, but remember that it has a lot of olive oil in it, so if you are going to put it on your pizza put it on the bottom and spread as thin a layer as you can or it will be too greasy. And yes, there is such a thing as a too-greasy pizza. For my basic pizza crust recipe go here. To see how to make a pizza, go here. For all pizza posts, click on the Pizza label.